The most talked about 2018 Grammy Awards were aired live from Madison Square Garden in New York City on CBS on Sunday, January 28. However, someone whole stole the limelight from the starry night is 6 years old kid, Blue Ivy Carter, daughter of Beyoncé and JAY-Z. Little Blue kept her superstar parents, Beyoncé and JAY-Z in line as she arrived at the awards night. Later, she turned the heads by asking her parents to stop applauding while Camila Cabello was giving a speech. Blue was caught putting up her hand and gesturing toward both her mother, Beyoncé and father, Jay Z. 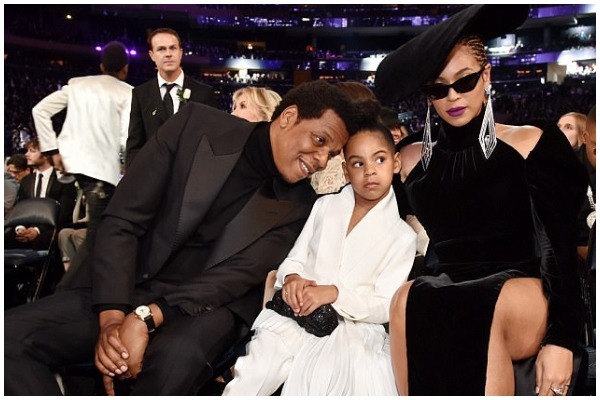 Seated in between her parents, Blue made a gesture that appeared to say “clam down” or “hold your excitement”. This only proved that who is the real ruler of Beyoncé and Jay-Z’s home. The adorable moment has gone viral on social media. Beyonce, Bruno Mars, Drake – American Music Awards 2017 Complete Winners List! Blue Ivy is the real Queen ?, not Beyonce ? JAY-Z looked dashing in an all-black suit, while Beyoncé wore a high-neck black velvet gown featuring cut-out shoulders. She finished the look with shoulder-length earrings, shades, a hat and purple lipstick.